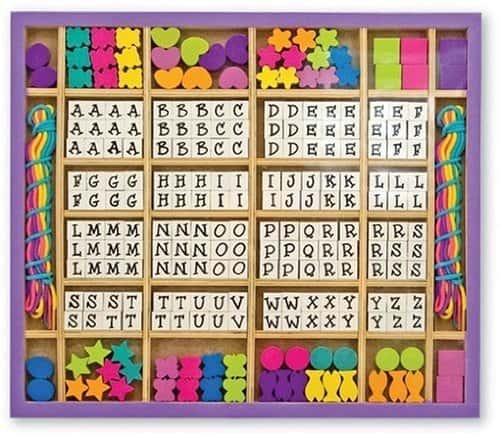 The Melissa & Doug Deluxe Wooden Stringing Beads Kit with over 200 beads is on sale for $9.83 at Amazon right now. That's 42% off the list price of $16.99! More Melissa & Doug arts and crafts deals . . . The Melissa & Doug Blendy Pen – Mega is on sale for $14.53. That's 27% off the list price of $19.99! The Melissa & Doug Wooden Flower Chest – DYO is on sale for $5.98. That's 33% off the list price of $8.99! The Melissa & Doug Peel & Press Sticker by Number – Butterfly is on sale for $6.84. That's 32% off the list price of $9.99! The Melissa & Doug Wooden Princess Mirror – DYO is on sale for $5.31. That's 34% off the list price of $7.99! The Melissa & Doug Rainbow 6 Color Stamp Pad is on sale for $5.62. That's 44% off the list price of $9.99!